Silent Spring’s big lesson? The notion that we can control nature without dooming ourselves is crazy. There may be no better time than now to re-read Rachel Carson’s Silent Spring. Originally published in 1962, it sparked the modern environmental movement that led to the Clean Water and the Clean Air Acts — now endangered, like the Endangered Species Act, under the Trump administration and the GOP dominated Congress. 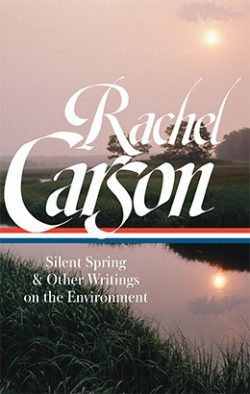 Luckily, there is a new edition of Silent Spring out from Library of America, the first in a series of re-publications of Carson’s work. The deluxe illustrated volume is bundled with an unprecedented collection of letters, speeches, and other writings that reveal the extraordinary courage and vision of its author. And the introduction is written by another courageous and visionary environmental scientist and writer, Sandra Steingraber. Steingraber has written powerfully about her own environmentally caused bout with cancer, as well as the dangers we all face from chemical toxins, climate change and fracking. Her books include Raising Elijah and Living Downstream, both of which interweave the personal and the scientific to explore the toll of environmental pollution. She is the perfect representative to bring Rachel Carson’s work again to the public. Back in February, we spoke with Carey Gillam about her book Whitewash: The Story of a Weedkiller, Cancer and the Corruption of Science. Her book is about the ubiquitous weedkiller glyphosate, AKA Roundup. Although glyphosate has been deemed a probable human carcinogen by the World Health Organization, Trump’s EPA disagrees. We play an excerpt of that interview. Listen to the entire interview here. Wonderfully informative interview. It was a pleasure to listen to two very articlate women.